Taḷḷapāka Annamācārya (or Annamayya) (May 22, 1408 – February 14, 1503) was a 15th-century Hindu saint and is the earliest known Indian musician to compose songs called sankirtanas in praise of the god Venkateswara, a form of Vishnu. The musical form of the keertana songs that he composed, which are still popular among Carnatic music concert artists, have strongly influenced the structure of Carnatic music compositions. Annamacharya is remembered for his saintly life, and is honoured as a great devotee of Vishnu by devotees and saintly singers. Annamacharya was born on Vaishakha Shuddha Pournami in the year Sarwadhari (May 22, 1408) in Tallapaka, a village in current day Kadapa district of Andhra Pradesh, India. He was born into a [[nandavarika] brahmin] family. He later became a Sri Vaishnavite saint, initiated by Venkatesha. His wife, Timmakka, had written Subhadra Kalyanam, and is considered the first female poet in Telugu literature. Their son, Pedda Tirumalacharya, and grandson, Tallapaka Chinnayya, were also composers and poets. The Tallapaka compositions are considered to have dominated and influenced the structure of Carnatic music compositions. Annamacharya lived for 94 years until Phalguna Bahula Dvadashi (12th day after full moon) in the year Dhundhubhi (February 14, 1503). 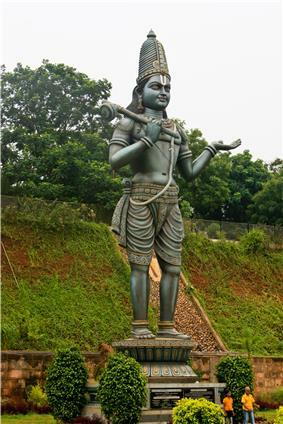 A statue of Tallapaka Annamacharya situated at the Sarada River Park in Anakapalle, Andhra Pradesh. 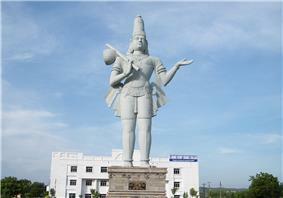 10-story tall statue of Sri Tallapaka Annamacharya located at the entrance of Tallapaka. 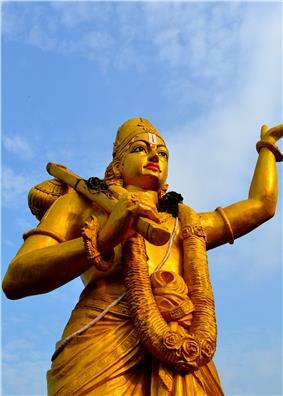 Annamacharya is said to have composed as many as 32,000 sankeertanas (songs) on the god Venkateswara, of which only about 12,000 are available today. He is also the author of musical treatise called "Sankirthana lakshanamu". Annamacharya considered his compositions as floral offerings to Venkateswara. In the poems, he praises the deity, describes his love for him, argues and quarrels with the Lord, confesses the devotee's failures and apprehensions, and surrenders himself to Venkateshwara. His songs are classified into the Adhyaatma (spiritual) and Sringaara (romantic) sankeertanas genres. His songs in the "Sringaara" genre worship Venkateswara by describing the romantic adventures of Venkateshwara and his consort Alamelu, while others describe the Bhakti of his devotees. While he enjoyed popularity in his days, his compositions were forgotten for over three centuries. Mentioned in 1849, they were later found engraved on copper plates, hidden for centuries inside the Sri Venkateshwara temple at Tirumala, just opposite the Hundi, concealed in a very small room. An English translation of 150 of these verses was published in 2005. Tirumala Tirupati Devasthanams, also known as TTD, has been endeavouring to preserve the rich heritage of his compositions. In the year 1950, The State Government of Andhra Pradesh created a committee and appointed Dr M Balamuralikrishna as its head. He set music to over 800 compositions of Annamacharya and are still popular among the devotees. He has been the Āsthāna Gāyaka of the Tirumala temple at Tirupati since two decades. He is regarded as a legend in rendering devotional music in classical style, especially the Annamacharya Sankirtanas. He is also an acclaimed poet, singer, and a musicologist. Padmashri by Government of India, in 2010 in recognition of her efforts to promote Annamayya Compositions. This is a partial list of some of the more famous Annamacharya compositions. ^ Jackson (1999), p. 105. ^ a b Jackson (1999), p. 216. ^ Jackson (1999), p. 265.